I’m sure this conversation was nowhere as heated as it looks. Tom always has great expressions. We all spent the 4th of July in Sutton, WV at Maplewood. I’ll stick up a picture of the house at some point too. edit — Here’s the house. 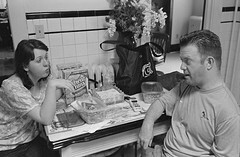 I think they were arguing about the Wheat Thins (see the empty box in the background). Evidently, Thom scarfed down 4 boxes of them and then proceeded to deny the whole thing. At one point, no joke, I heard him claiming that he only ate food he himself grew macrobiotically. You’re probably right. I do remember Tom going on about the Wheat Thins. I don’t think the Wheat Thins had anything to do with the conversation. I think we were most likely arguing over the validity of Muddy Buddies as a variety of Chex mix. He did scarf down an entire container of original Chex Mix in less than an hour. Muddy buddies? Aren’t those “My Buddy” dolls designed for rougher outdoor conditions?